Our life in the dead of winter. It's colder than a wicked witch's ta-ta's in Boston. We've been a bit cooped up lately, what with the newborn and the fact that our front yard is now a sub-zero freezer. And somehow we've gone from a formerly TV-free household to one that recently had to replace its DVD player because it... err... fizzled out? We've been watching a lot of movies lately. They've become a bit of a crutch for me. Sometimes it's all I can do to occupy Julia so I can nurse Charlie or cook dinner. I realize that I should be engaging her in some slightly more enriching activities, like perhaps lessons in the principles of thermodynamics as I boil the water for spaghetti, or a frank discussion about carbon emissions as I take out the trash, but poor Charlie has been screaming like a banshee for the past few days and nights, and I am so tired. So, here we are, a bunch of couch-potato junkies, popping movies into the DVD player like pills. This morning, I put in The Sound of Music and later found Julia pretending to sleep on the stairs. "Juje, what are you doing?" I asked. "No, I'm Gretl. You're Liesl." she replied. "Now you carry me upstairs and sing "For long. Farewell.'" We'll watch Fiddler on the Roof and later find Julia absorbed in a tea party, raising her tiny tea cup and shouting: "To life! To life! L'chai-im!" before tossing her tea back like a shot of vodka. One time, I thought her brains were getting a bit scrambled when she was acting out the scene from Cinderella where the prince tries to find his elusive love with the wayward glass slipper. Only, Julia was trying to put one of her tiny ruby slippers on Will's foot. "Juje," I interrupted, "Are you trying to see if Daddy is Cinderella?" "No!" she sighed, with the exasperation of a 13-year-old. "I'm trying to see if he's the wicked witch!" I must admit that the Cinderella thing has had me increasingly worried. Cinderella seems to be popping up more and more often in Julia's playtime musings. 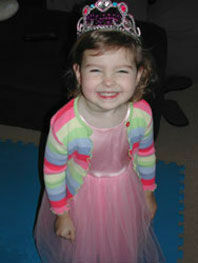 She refuses to wear anything but a dress these days—often with a tiara. I'm thinking that maybe she's getting a bit brainwashed? Julia, donning her apron: "I'm Cinderella. You're the mean stepmother. What do I have to do now, mean stepmother?" Me: "Mop the floors, Cinderella!" Julia: "What do I have to do now, mean stepmother?" Me: "Fold the laundry, Cinderella!" Cinderella has other benefits, too. Like, when Julia wants me to be the prince. She grasps both of my hands and swings me into a dance, gazing dreamily up into my eyes as she croons: "So this is Looooooooooooooooove." "No, I'm Cinderella. You're the prince."